Chief Wawatam, an Ojibway Indian living at the Straits of Mackinac, befriended the British fur trader Alexander Henry as a brother. 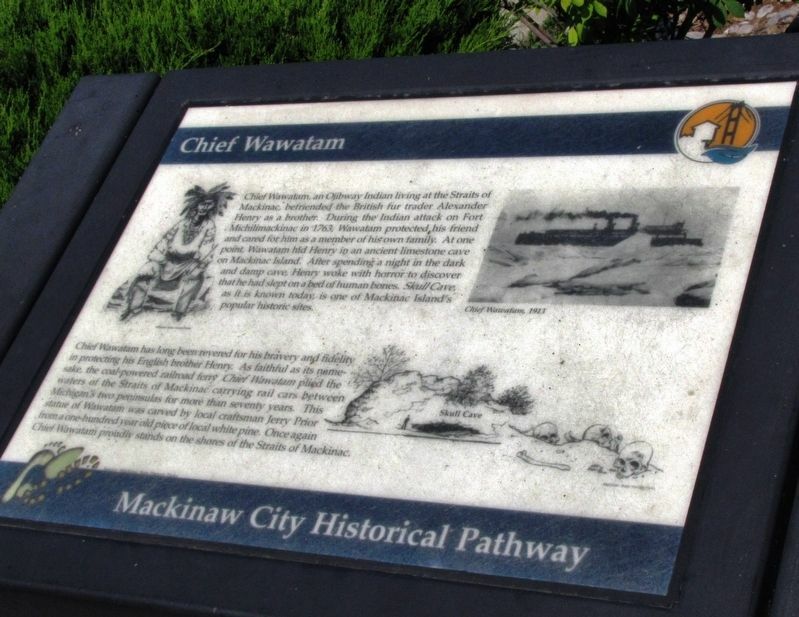 During the Indian attack on Fort Michilimackinac in 1763, Wawatam protected his friend and cared for him as a member of his own family. At one point, Wawatam hid Henry in an ancient limestone cave on Mackinac Island. After spending a night in the dark and damp cave, Henry woke with horror to discover that he had slept on a bed of human bones. Skull Cave, as it is known today, is one of Mackinac Island’s popular historic sites. Chief Wawatam has long been revered for his bravery and fidelity in protecting his English brother Henry. As faithful as its namesake, the coal-powered railroad ferry Chief Wawatam plied the waters of the Straits of Mackinac carrying rail cars between Michigan’s two peninsulas for more than seventy years. This statue of Wawatam was carved by local craftsman Jerry Prior from a one-hundred year old piece of local white pine. 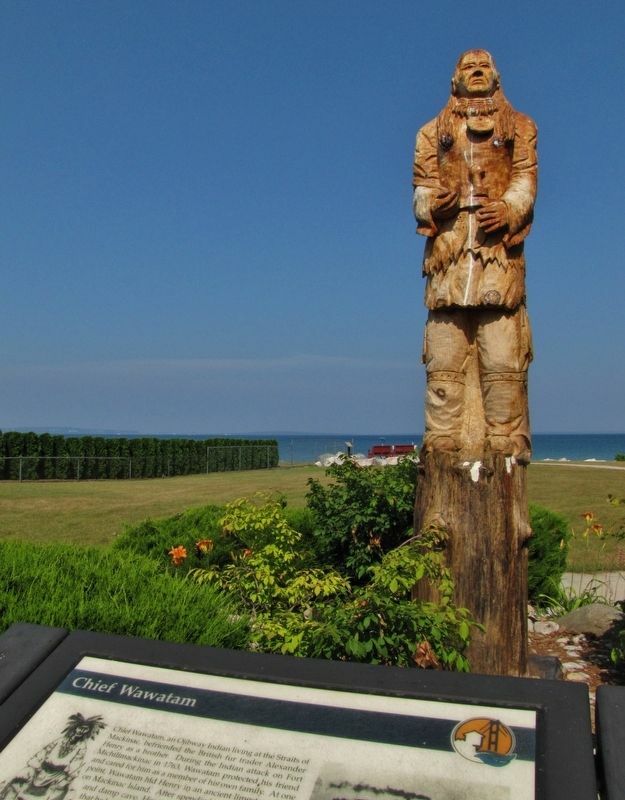 Once again, Chief Wawatam proudly stands on the shores of the Straits of Mackinac. Location. 45° 47.017′ N, 84° 43.422′ W. Marker is in Mackinaw City, Michigan, in Cheboygan County. Marker can be reached from the intersection of North Huron Avenue and East Jamet Street, on the right when traveling north. Touch for map. 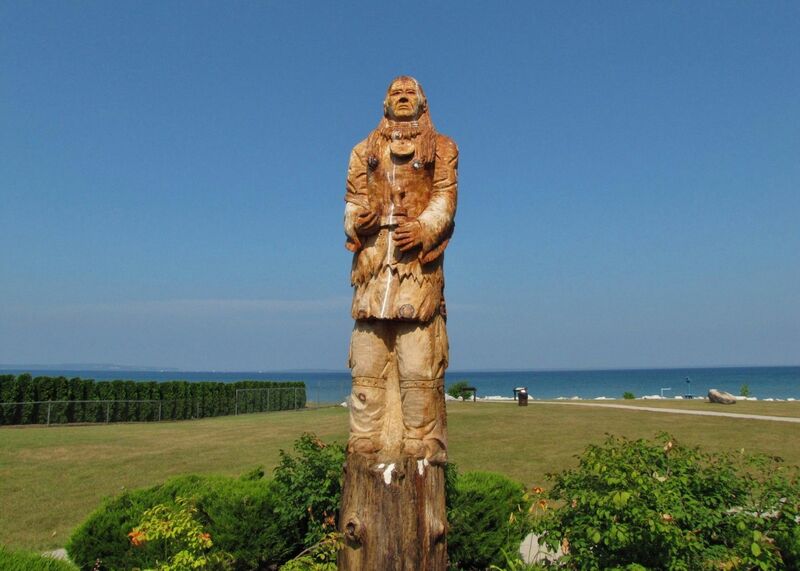 Marker and Chief Wawatam tree trunk sculpture are located beside the sidewalk, at the center of Mackinaw City's Wawatam Park. Marker is in this post office area: Mackinaw City MI 49701, United States of America. Touch for directions. Other nearby markers. At least 8 other markers are within walking distance of this marker. Island-Hopping the Straits (within shouting distance of this marker); The Dixie Highway (approx. 0.2 miles away); Historic Mackinaw City (approx. 0.2 miles away); a different marker also named Chief Wawatam (approx. 0.2 miles away); Iron Horse (approx. 0.2 miles away); Mackinaw City (approx. 0.2 miles away); The Algomah (approx. 0.2 miles away); Mackinaw, Mackinac or Michilimackinac? (approx. 0.2 miles away). Touch for a list and map of all markers in Mackinaw City. More. Search the internet for Chief Wawatam. Credits. This page was last revised on April 4, 2019. This page originally submitted on April 1, 2019, by Cosmos Mariner of Cape Canaveral, Florida. This page has been viewed 119 times since then. Photos: 1, 2, 3. submitted on April 4, 2019, by Cosmos Mariner of Cape Canaveral, Florida.